#1 Pest Control Johns Creek - North Fulton Pest Solutions - Call Today! We are a full-service Johns Creek pest control company that serves not only the city of Johns Creek but also all of Metro Atlanta. Most noteworthy, North Fulton Pest Solutions offers complete residential pest control services, commercial pest control services, mosquito control services, wildlife removal, and termite treatments. Also, we offer services to make your home or business more energy efficient and less hospitable for insects, rodents, and larger nuisance animals. Because we provide expert pest and wildlife control services, your home or business will be more comfortable and pleasant, inside and out. We are pleased to offer green pest control services because we care about you and the environment. Environmentally responsible pest control offers a reduced risk alternative to conventional pest control service. And our green Johns Creek pest control treatments are an excellent alternative for those looking to increase their level of environmental stewardship. No Hassle, Money-Back Guarantee: We back our annual service programs by our written Money-Back Guarantee. We Create Pest-Free Living Environments: With our total protection pest management program, we not only eradicate your pests; we vacuum them and take them with us! It’s all part of our insect vacuum and web removal services. On-Staff Entomologist and Licensed Certified Operators: We assign these in-house experts to every account. No other Georgia exterminators can offer you our level of expertise! Full Service Termite Treatments, Pest Control, Wildlife Removal & More: We provide a complete line of termite control, pest control, and wildlife removal services, plus attic insulation with built-in pest resistance, gutter protection systems, mosquito control and more. A Trusted Name for Over 45 Years: We are locally-owned and operated. Most of all, we care about your home and family as much as we care about our own. And that’s why all of our technicians go through extensive criminal background investigations. We are proud to be a drug-free work place. Value You Can Count On: We deliver the most pest control value for your hard-earned dollars. A termite infestation is bad news for a homeowner. The damage they can do to your home and property can be very expensive. Unfortunately, termites are very common in Johns Creek. North Fulton Pest Solutions provides environmentally responsible, effective Termite Control in Johns Creek, GA. The products we use are proven effective and some of the most advanced in the industry. Add that to our Damage Repair Guarantees and Lifetime Renewable Guarantees and you can rest assured that we will get the job done right. We use two of the most effective termite control products you can get when protecting your home. Sentricon® Termite Colony Elimination System with Always Active™ Technology. This green product is used to protect the Statue of Liberty, the White House as well as millions of other homes just like yours. It is a very effective system that treats both the colony and individual termites with its Recruit® HD termite bait. This bait is placed in every station on the day of installation to ensure that you receive termite protection from day one! There’s no comparison between the Sentricon® System with Always Active Technology™ and other so called “termite baiting systems,” which contain no termite bait at all when installed. Termidor® Termite Treatment. This is a unique liquid, non-repellant termiticide that destroys individual termites and “contaminates” the colony to give you complete termite control. This product has a unique feature called the “Transfer Effect™”. Basically, termites come into contact or ingest the termiticide and then transfer it to other termites and ultimately on to the entire colony (think domino or contagious effect) for total colony control. North Fulton Pest Solutions is one of two companies around the Johns Creek, GA area that participates in the Builder’s Club program. Builders can make qualifying purchases like our preconstruction termite treatments and earn Club Points that can be redeemed for valuable rewards. A termite inspection is the first step in termite treatment plans and termite services. Many times, we recommend a hybrid treatment protocol which combines Sentricon® and Termidor® to keep termites away from your home and under control. We’ll begin with a termite inspection of your home and property, and then prepare a treatment protocol specifically tailored to your home to provide continuous termite control and protection. Selling or buying a home has many concerns, and termites are high on that list. An Official Georgia Wood Infestation Inspection Report (commonly referred to as a “termite clearance letter”) and a termite inspection for your Johns Creek home are necessary steps in protecting both buyers and sellers. Real estate agents and homeowners can submit their requests by using our convenient request form that is located right on our website. 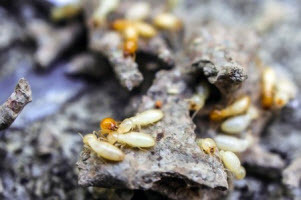 At North Fulton Pest Solutions, we provide professional termite control in Johns Creek, GA. We’ll work with you to develop a termite control plan that best meets your termite control needs. If you think you have termites, know you do, or just enjoy having that peace of mind knowing you have great termite protection, call us. For over 45 years, we have provided effective pest and wildlife control in Johns Creek. As a result, we’ve earned a reputation as a reliable pest control company. Furthermore, we have an A+ rating with the Better Business Bureau and a superb 5 STAR Rating on Kudzu. Finally, our ability to provide environmentally responsible and effective pest control services is due to our years of industry experience, our knowledge of pests common to the Southeast, and the continuous education of or pest specialists ensuring you receive the most up to date service techniques, products, and technology available.